From 23rd to 25thApril 2018, members of the Xolobeni community of the Wild Coast of South Africa are taking the South African Department of Mineral Resources (DMR) to the Pretoria High Court over attempts to mine in their land. This initiative is lead by the Amadiba Crisis Committee, formed in the early 2000s to resist attempts by Australian mining conglomerate Mineral Resources Commodities to mine titanium on their land. The legal representatives of the Committee request that the DRM cannot issue a mining license without the community’s consent. A successful ruling would have implications for all mining-affected communities. Since it will set a historic precedent that would place the voices and needs of those most affected by mining activities in South Africa and across the African continent. 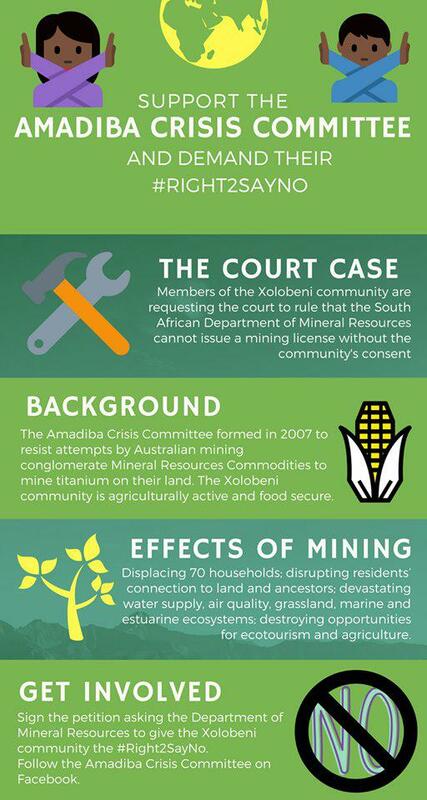 This court case is part of a larger “Right to say NO” campaign that involves mining-affected communities across Southern Africa. The mining project planned in the Xolobeni community’s land would mean the displacement of about 200 households from their ancestral land. It will harm the community’s agricultural activities, polluting their water and land and jeopardizing the prospect of sustainable activities they can control. The Global Campaign to Reclaim Peoples Sovereignty, Dismantle Corporate Power and Stop Impunity, a network of over 200 social movements, networks, organisations and affected communities resisting the land grabs, extractive mining, exploitative wages and environmental destruction of TNCs in different global regions particularly in Africa, Asia and Latin America, aims to express its strong solidarity and support to the Amadiba Crisis Committee in their demand for the Right to Say No. This initiative is crucial in order to strengthen communities’ rights and advancing on the building of law from below.